Fright Nights - The Android Invasion / Invasion of the Bodysnatchers | Warped Factor - Words in the Key of Geek. 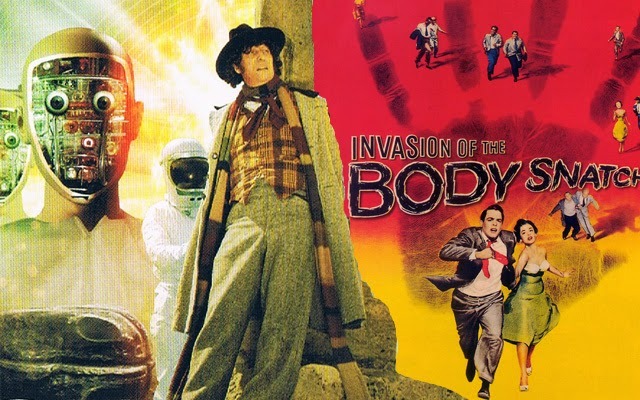 Christopher Morley looks at the 1975 Doctor Who story 'The Android Invasion', and its similarities with Invasion of the Bodysnatchers. Before The Brain Of Morbius, there was The Android Invasion- a very different kind of terror! What if you found yourself the only remaining trace of humanity in a world besieged by alien intelligence? 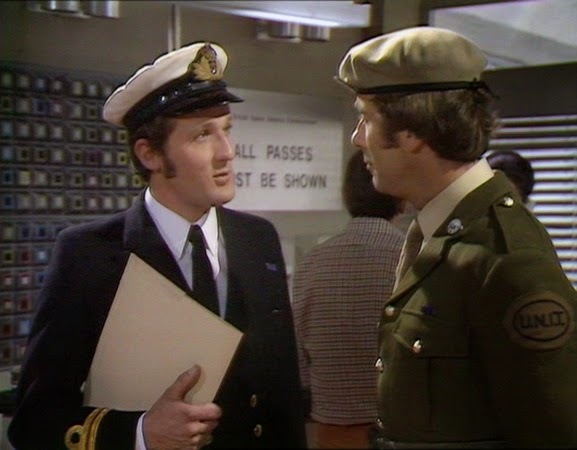 Sarah-Jane Smith is about to face that particular dilemma, as did Dr Miles Bennell in Don Siegel's Invasion Of The Bodysnatchers. 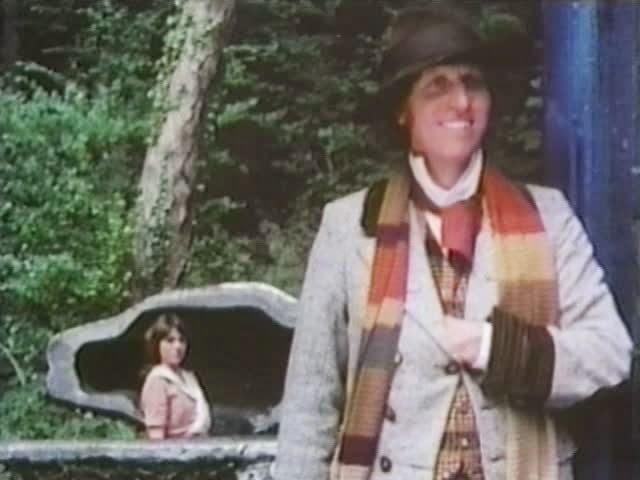 While he found himself in Santa Mira, California, battling alien duplicates grown from pods, the Fourth Doctor & Sarah-Jane Smith are across the pond in the leafy English village of Devesham. Or so they think. As ever with Doctor Who, the truth isn't quite that simple. And in retrospect it should be fairly easy to work out that the ' people' of the place are a bit robotic in nature. Who are those chaps in white, too? That & the fact they've got guns in their index fingers of course. Coins are also at the centre of the intrigue, as are mysterious caskets- just what is going on? 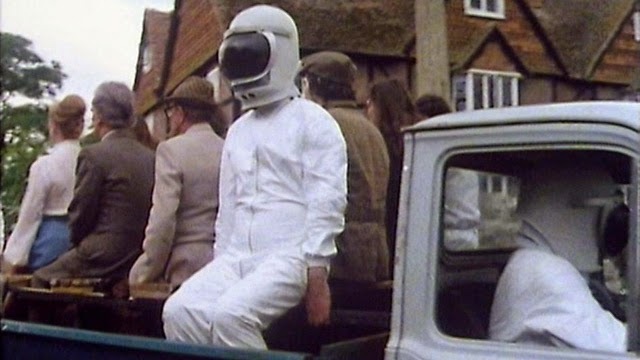 In a commendable display of man-logic, the Doctor sets off for the local pub- the Fleur-de-Lys. For some unfathomable reason it's completely deserted! Until a truckload of villagers turn up & finally do what's probably expected of them, taking their seats. Almost mechanically they take their seats & do nothing until eight o'clock sharp- at which point the pub becomes just like any other. There's a Space Defence Station nearby too. The plot thickens..........as you can probably guess its not long until the Doctor investigates. After all we've still got the mystery of who's creating these androids to solve, haven't we? They've got a little help, as it transpires. Back at the station, astronaut Guy Crayford is working with these creators- the Kraals! Led by Styggron, they've managed to seed what is actually a replica of Devesham with replicants of the original residents, which retain the memories of their source material.The brain-scanning process used in their creation looks a bit painful though! Even the Doctor is very nearly caught out. The real Sarah's still alive, pretending to be unconscious so that she can listen in on Styggron's grand plan to use a virus to rid the Earth of all human life. They want it to replace their home world of Oseidon, which has dangerously high levels of radiation in its atmosphere- a fact which the Doctor had actually first picked up on arrival! Crayford is helping them as he's been brainwashed to believe that they rescued him after his rocket crashed on the way to Jupiter, repairing his damaged body save for his right eye ( all of which is actually fine, meaning he has no real need for his eye-patch). He's also been told his ship will be sent back through time to make a safe landing on Earth- the means by which the androids will invade, 'Devesham' actually only a mere training ground. Starting to sound a lot like Bodysnatchers the more we go on, isn't it? Both feature a Doctor, both are witness to an extraterrestrial invasion with 'aliens' who intend to repopulate with their own species. 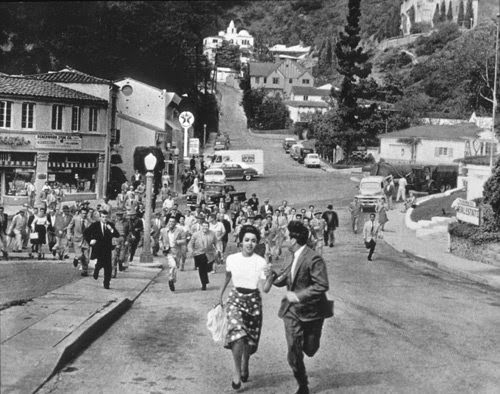 Writer Terry Nation was indeed very much influenced by Invasion of the Bodysnatchers, & The Android Invasion would prove to be his penultimate contribution to the series before Destiny Of The Daleks. The Android Invasion also marked the final appearances of John Levene as Sergeant Benton & Ian Marter as Harry Sullivan. Neither, though, apparently enjoyed their finale. Marter would tell Doctor Who Magazine that "There was no real reason for Harry to be in it... I couldn't see the point" while Levene was said to be miffed that none of Benton's old UNIT colleagues were involved. They were, though, the first previously departed companions to return to make a guest appearance- having first shared the screen in Terror Of The Zygons. The scare count would creep up throughout the rest of Season 13 & into 14, too!